At the age of 10, Joshleen Durand from Paarl in the Western Cape is not only defeating dyslexia and dyscalculia but also excelling academically with an overall average of 62.5 percent. Joshleen and other top pupils who received additional reading and learning support after school at Edublox centres around the country celebrated truly amazing academic progress in 2015, and experienced personal success in other areas of their lives too. For all their effort, hard work, perseverance and exceptional performance, each top pupil received a R1000 prize. Another top pupil from the province is Yumna Isaacs, who was in matric last year at Wynberg Girls High School in Cape Town. She improved her overall average from 47 percent to 66 percent. Wiehan Lombard, now a Grade 7 prefect at Slot van die Paarl Primary School in Paarl, went from failing all of his subjects in Grade 6 to being awarded a merit certificate for the same subjects and also winning a “Top Learner” award from Edublox. “When you take into account that these exceptional pupils had to work hard and overcome great personal challenges, it is evident that their perseverance carried them through,” says Susan du Plessis, Director of Educational Programmes at Edublox. At a young age the pupils had to adopt a strong mental attitude to deal with the pressure that they were under as a result of their poor academic performance. Poor academic results may also prevent them from performing in sports or experiencing success in their social life. “Yumna’s determination played a large role in improving her confidence and self-esteem in so many other aspects of her learning and life,” says Fairuz Isaacs, Yumna’s mother. The determination shown by these top pupils, together with foundational skills that they have learnt with help from Edublox classes, proved to be a winning recipe. “The foundational skills created a snowball effect that led to success in other aspects of their development such as sporting ability and social skills to take on leadership responsibilities,” says Ms du Plessis. Joshleen not only improved academically but excelled in her extracurricular activity. “Before Joshleen joined Edublox, all of her ballet teachers complained that she was having difficulty concentrating and memorising the routines. “However, by the end of 2015, her hard work paid off as her performance improved and she passed her Grade 2 Royal Academy of Dance ballet exam,” says Joshleen’s mother Bronwyn Durand. An improved memory and better concentration assisted the aspiring ballerina in remembering her dance routines. “Improvement in memory and sustained attention has an added direct influence on a students’ sporting ability,” explains Ms Du Plessis. Leadership development is another aspect of personal growth exhibited when children show signs of improving academically. Annalize Lombard, mother of Wiehan in Grade 7 at Slot van die Paarl Primary School, is thrilled with her son’s improved grades. She believes that they have given him the confidence to take on leadership opportunities he would previously not have had. “The cherry on the cake was most definitely when Wiehan was elected as a member of the Grade 7 student council for 2016,” Lombard adds excitedly. As Yumna’s marks improved, her confidence levels increased and she was also selected for leadership positions on her school’s Matric Committee and the Muslim Students Association Committee. “She started making new friends and her peers were approaching her for help,” says her proud mother. 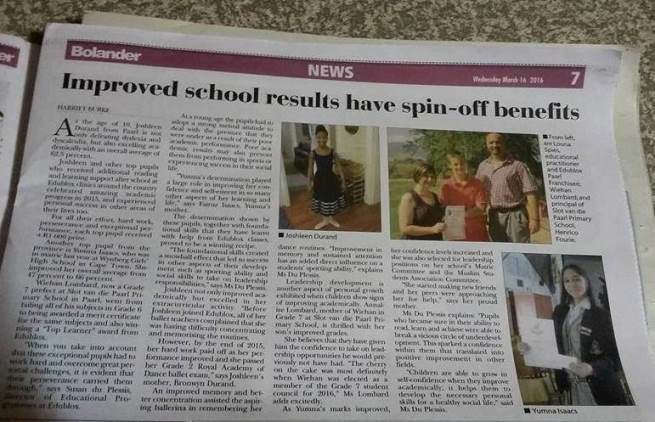 Ms Du Plessis explains: “Pupils who became sure in their ability to read, learn and achieve were able to break a vicious circle of underdevelopment. This sparked a confidence within them that translated into positive improvement in other fields. “Children are able to grow in self-confidence when they improve academically; it helps them to develop the necessary personal skills for a healthy social life,” said Ms Du Plessis.